So, no need to buy ink cartridges, but you do need to purchase special labels. The good news is, since it’s such a popular printer, labels are relatively inexpensive and widely available. For example, you can buy 500 address sized labels from labelvalue.com for under $12. That’s about $0.02 a label. What can the DYMO LabelWriter 450 do for me? Well, chances are if you’re running a small business, you’re already in need of labels! The DYMO LabelWriter 450 can print a variety of labels from the most basic to some more interesting ones. 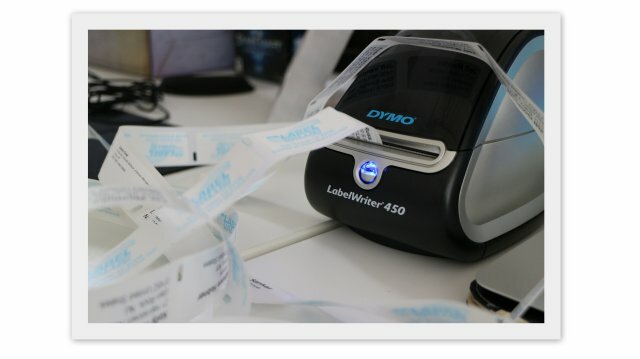 How do I print barcodes, stickers and labels using the DYMO LabelWriter 450? The DYMO LabelWriter series of printers also come with printing software that lets you edit and create labels very easily. Although this article mentions barcodes, your labels do not have to include barcodes on them. After you’ve designed your label, you simply press the big blue Print button and you are sticker printing in no time! We’ll look at more specific case examples below. How do I use the LabelWriter as a barcode printer? Say you make and sell candles and just finished a batch of 50 pieces that you need to label. First, you would pick an appropriately sized label and then go to Insert and click Barcode. You then have the option to select the barcode data and the type of barcode you wish to create. After you select your options, you can select 50 copies and then click Print. In a few moments, you’ll have 50 sticker barcodes ready to attach to your candles. Using inFlow Cloud to manage your inventory makes this even easier. inFlow can communicate directly with DYMO printers so that you can print labels as you receive them. It takes just a few minutes to set up and after that, you can print labels and manage your inventory from one app on your PC. 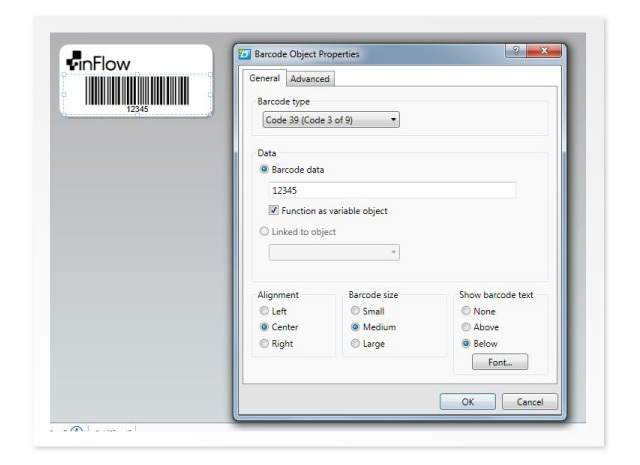 Print DYMO labels straight from inFlow Cloud for Windows! How do I print return address sticker labels? Similar to printing barcodes, you would select your label size, then go to “Insert” and click “Text” Use that space to put your address in. You can also add your company logo by inserting an image. How do I print label stickers with multiple mailing addresses from a list? In this scenario, there’s one extra step which involves adding addresses from an address book. You’ll find this process is very similar to Microsoft’s mail merge feature (except it’s a whole lot easier!). As always, you first select your label size, but this time you go to insert and then address. This puts in a text box (or a variable field) that you will enter your addresses in to or yo can import your addresses to this location. Next, get your addresses ready by saving them in Microsoft Excel. Have a column for the recipient’s name, address, city, province, country and postal/zip code (there’s no need to include headers). As a helpful hint, try to cut down on addresses that are exceptionally large by using abbreviations where possible. 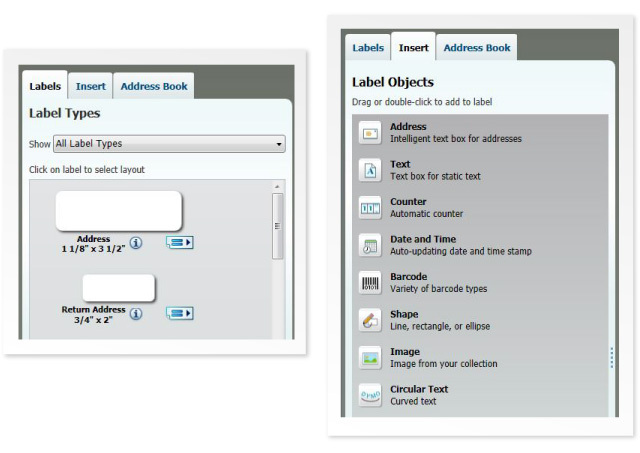 This is important because the DYMO software will automatically resize the font to fit the entire address on the label. If you have too much information, the font size could end up being very small. Once imported, you can now go over to the Address Book tab, select all addresses and press Print. Now each label you print will have a unique address! Don’t bother installing the software that comes bundled with the printer – it will be outdated and useless. Instead, head over to the DYMO website and download the latest version here. 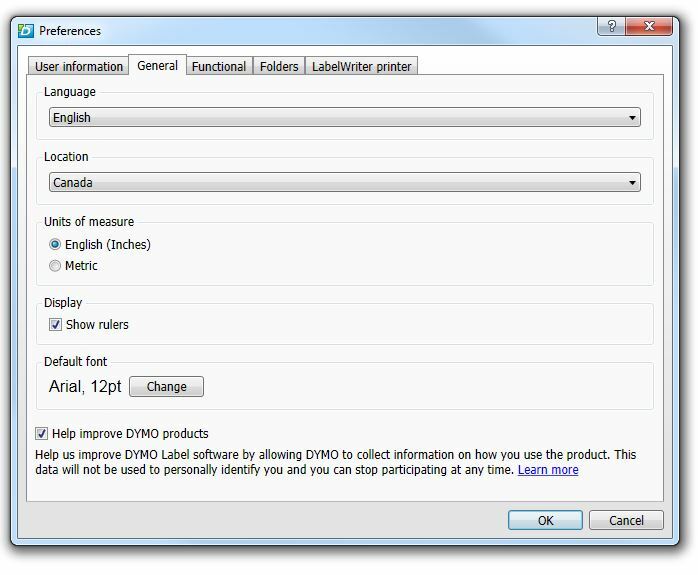 You can also download the latest DYMO software by clicking here. 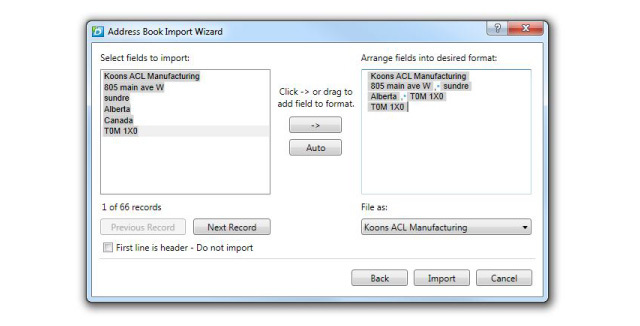 Since we’re located in Canada, label sizes inside the software were quoted in millimeters. However, if you’re buying labels from the US, they will be quoted in inches. This made it a pain to try to find the correct label type before printing. We had to go to Edit > Preferences > General and change the units of measure from Metric to English. Overall, the DYMO label printing software is really well designed. We do have one quick tip though: if you’re re-editing a template, you need to select the Insert tab in order to make changes. If you’re not on the Insert tab, you won’t be able to change anything on an existing label template. Where to buy a DYMO LabelWriter 450? Since it’s a popular product, any major retailer will typically carry the DYMO LabelWriter 450. Amazon.com typically has the lowest price. Can I add a ingredient table for each product and barcode with custom business logo on one label sticker using the 450? Please help! Hi Jameel, sorry for the late reply! Unfortunately it’s really down to what size of font and how you arrange the text on the label. Can I print the Barcode (UPC) along with other information such as Vendor, Part Number and Description. I do not understand what the barcode is for when I print a mailing label. Is the barcode the address? What is it used for? Why do I need a barcode? What does it do for me? Does the Post Office read the barcode with some kind of reader? I don’t see where you explain this. I think there may have been some confusion from our headers because we referred to the printer as both a label printer and a barcode printer. 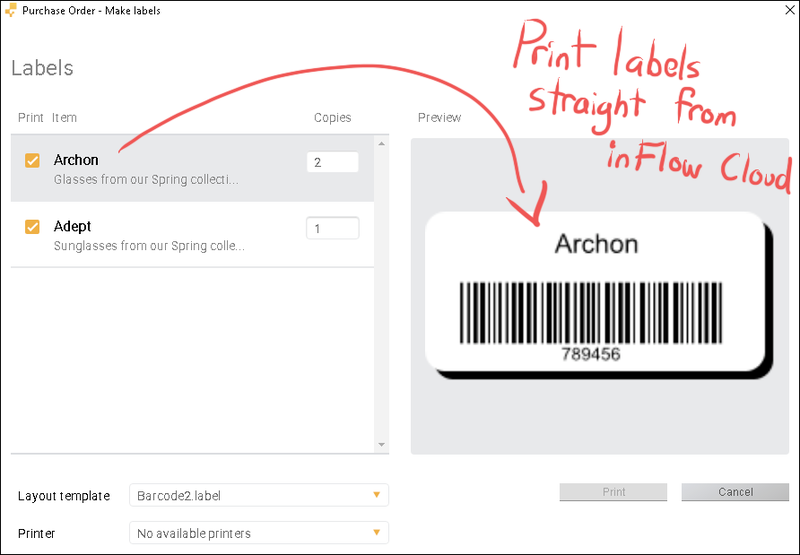 We’d meant to say you can print barcode stickers for your products using the LabelWriter 450, but you can also use it for creating other things, like mailing labels. Mailing labels would not need a barcode unless you were adding something like a scannable tracking number (but courier services usually have their own stickers for that). Sorry Azhar, I’m not sure I completely understand your question. If you see my response, could you provide a few more details about what you’d like to do? In the meantime I’ll add that the DYMO LabelWriter software is really the key to ensuring the labels and descriptions you want can be added to a printed label. Basically, you use DYMO’s software to set up templates, and then those templates will pull in bits of information to be used on the printed label. wow! it looks compact and small and easy to use. Nice, i like this printer and i want to buy for my business purpose. My Dymo label printer has stopped working. I installed a new roll of labels and it printed about 12 then stopped and I can’t get it to work. Help.